TVS Fiero FX is true value for your money. This new bike launched by TVS has created a sensation in the world of bikes and certainly has a bright future in Indian bike market. The bike has really stood the test of time and has caught the attention of many bike enthusiasts. The bike is a perfect combination of good performance, low maintenance and reliability. TVS Fiero FX comes in 3 sizzling colors – Metallic Silver, Blazing Red and Titian Blue. The bike has a slightly bulbous look. The broad multi reflector headlamps, stylish indicators, chrome mirrors and sleek taillights are really eye catching. The bike has a lot of chrome and to some extent classic looks. 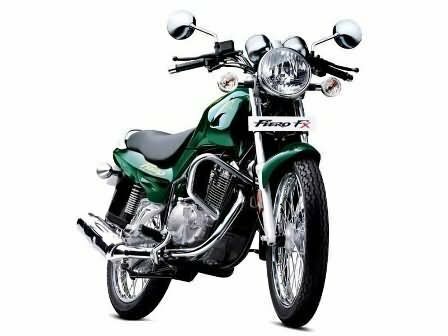 TVS Fiero FX has laid special attention for the comfort of the rider. The bike is adorned with Fuel Gauge, Trip Tacho Meter, Trip Meter, Turn signal lamps and Passenger Footrest. TVS Fiero FX has advanced safety features. The bike has hydraulically damped telescopic (front) suspension and Rectangular box swing arm (rear) suspension. The bike has 240 mm single disc (front) brakes and 130 mm expanding drum (rear) brakes. The broad tyres provide stability and grip at the time of driving. Loaded with hydraulic suspension and longer wheelbase the bike ensures comfort and safety. TVS Fiero FX has 147.50 cc, single cylinder, four stroke, OHC, digital CDI, air cooled engine. The engine produces a maximum power of 12 bhp at 7000 rpm and a maximum torque of 10.50 Nm at 6500 rpm. It supports 4-speed transmission gear box. The price of TVS Fiero FX is Rs. 50,000 (taking Mumbai as base price location). However, the price specified is indicative price only and reflects lowest approximate price which excludes tax, registration, insurance and cost of accessories.